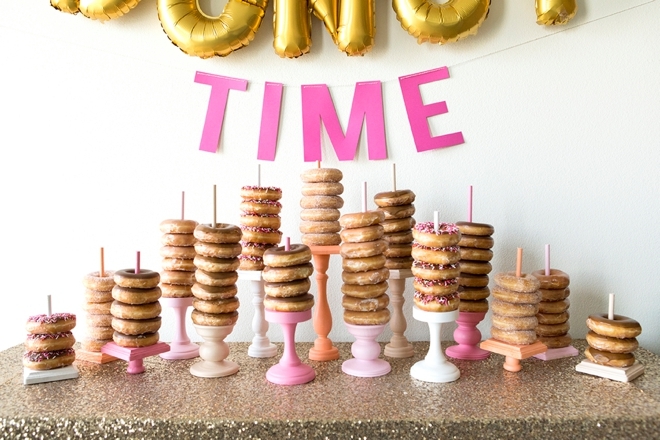 You HAVE To See This Adorable DIY Wedding Donut Bar! 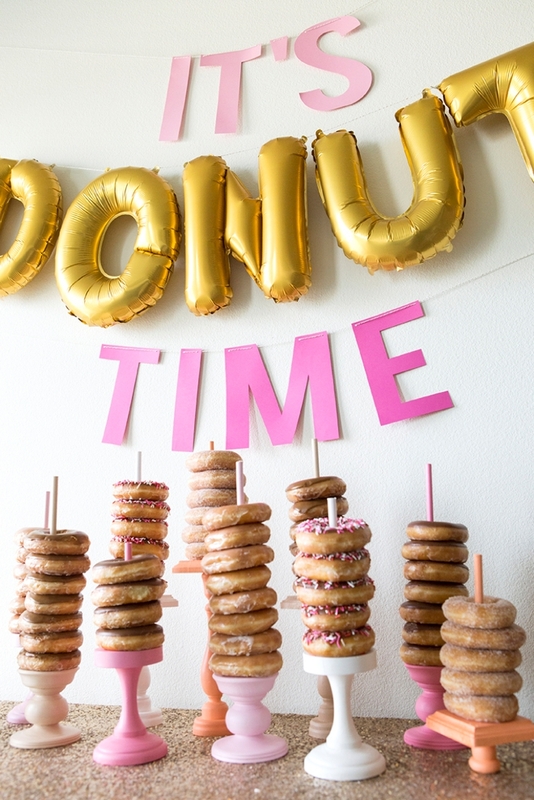 Yeeaaass, donuts. 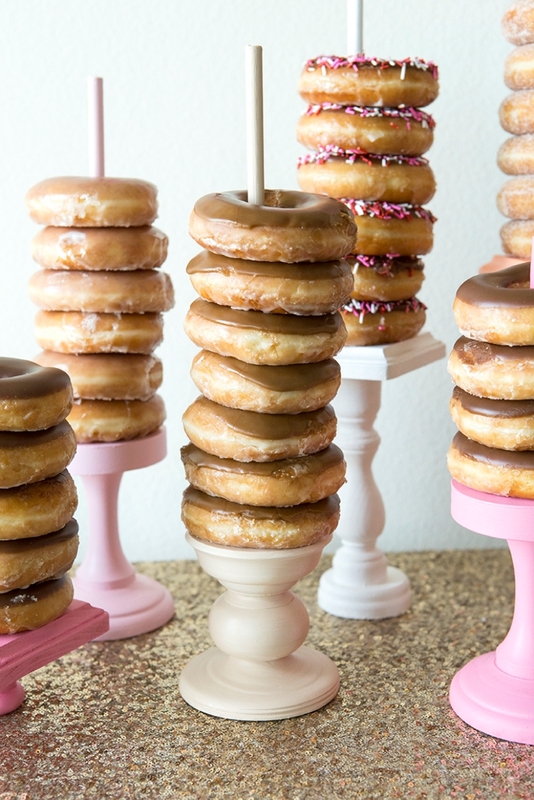 Wedding guests will always be excited to see donuts, especially when they look like this! 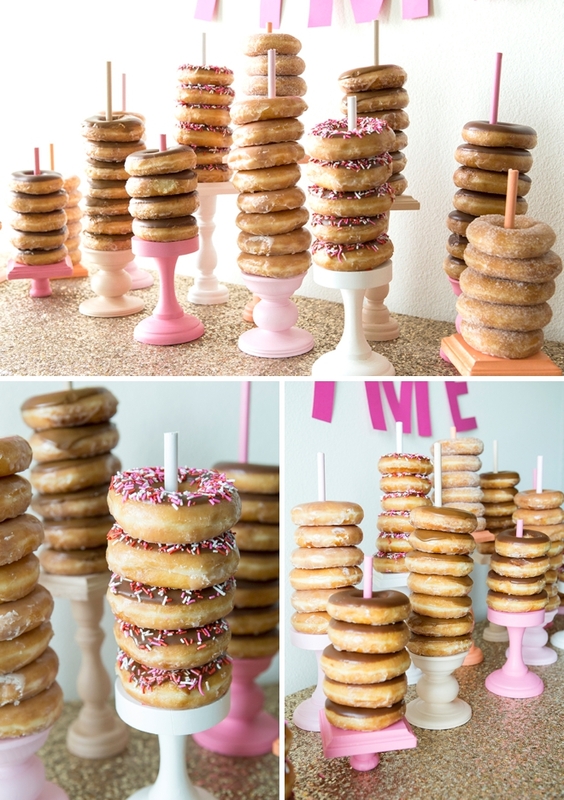 Donut walls are all the rage but this idea simplifies that new trend and makes it easy for everyone to create themselves, no matter what your crafting skill level. 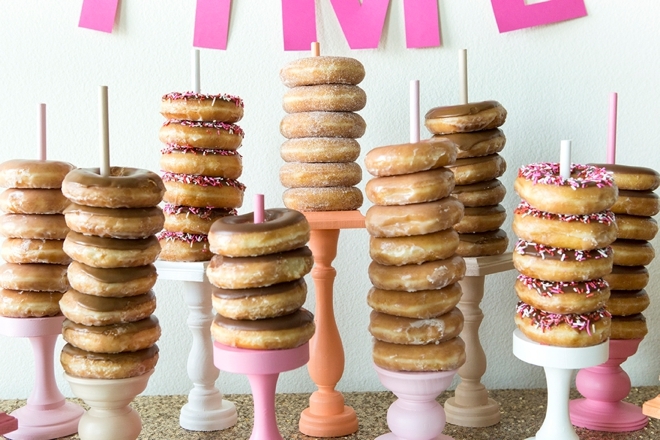 Make it large or make it small, these donut stands can do it all. 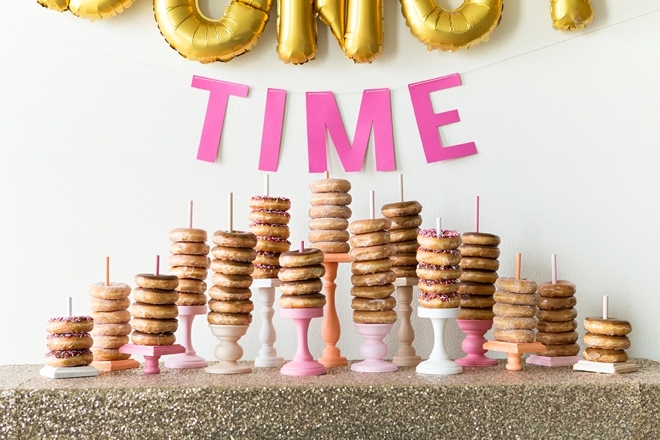 Embellish your unique display with some giant gold balloons and your favorite donuts! 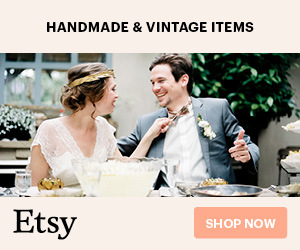 The 16″ gold letter balloons are such a fun, bright and happy element. 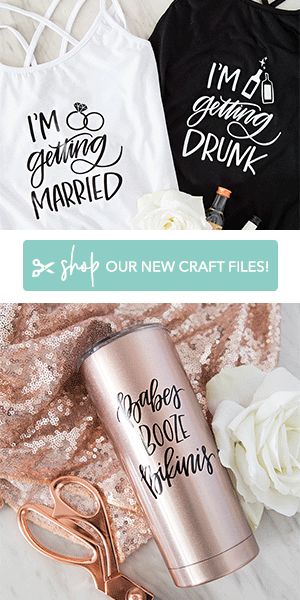 I cut the “IT’S TIME” out of cardstock using my Cricut Explore Air2, if you’d like to use the same exact files I did, click this link to take you straight to Design Space! 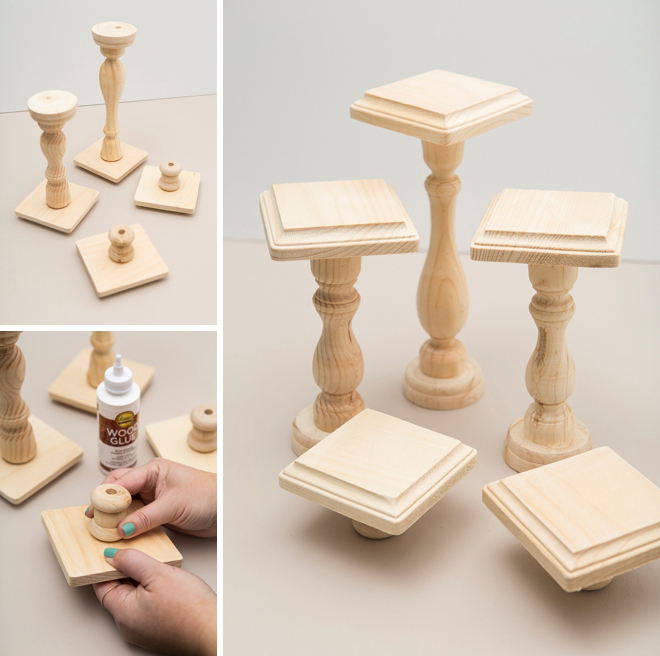 Search your local craft store and Amazon to find interesting and unique pieces of wood that you can glue together to make these pedestal bases. 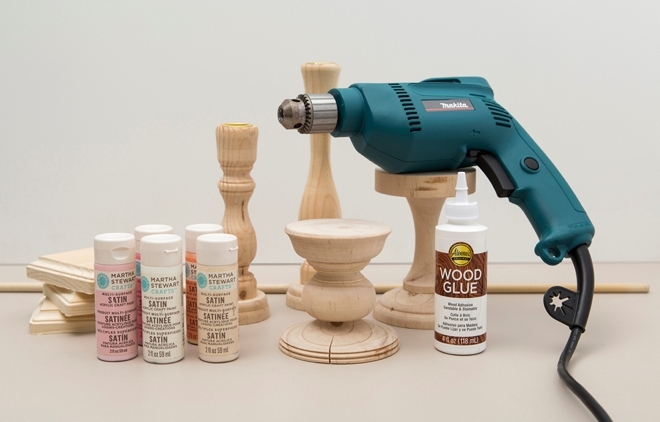 You can use candlesticks, blocks, spools, plaques, really anything that you like. 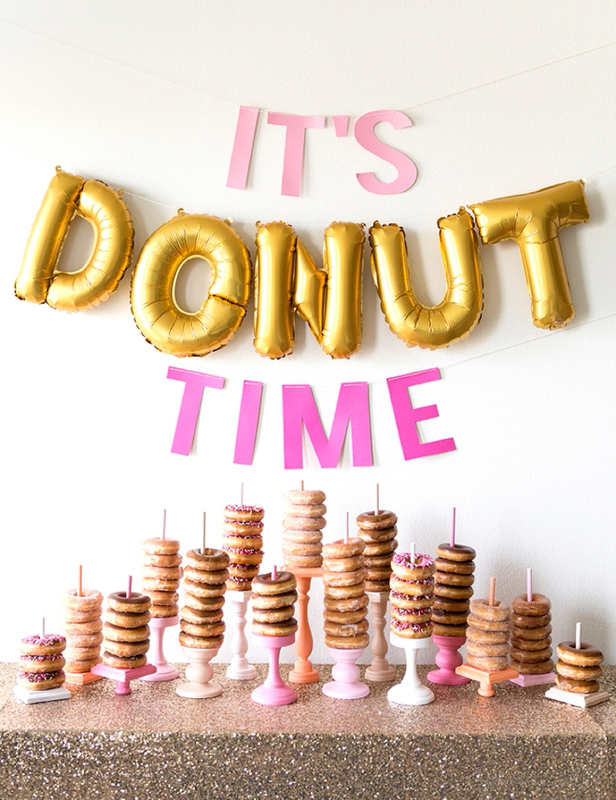 You’ll want to use plaques that are 4″ wide or round, as they’ll be the perfect size to support your donuts! 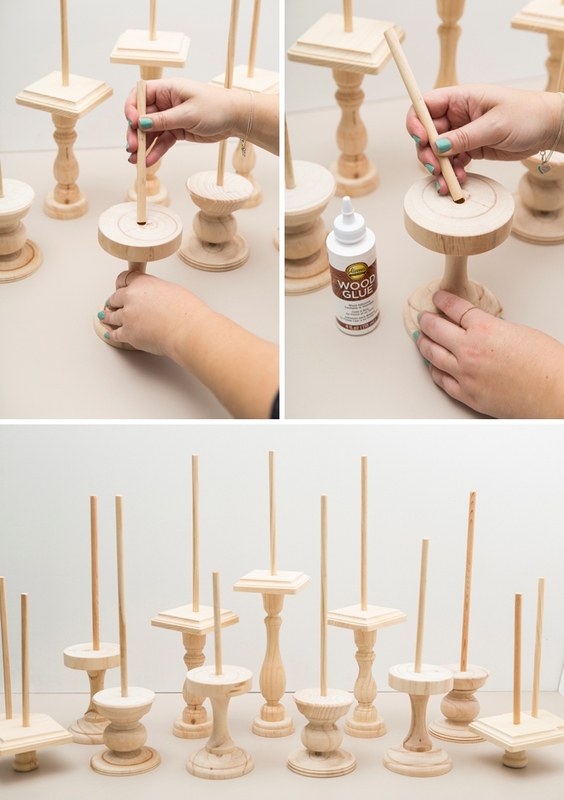 Once you’ve glued your bases together (and the glue is dry) drill holes in the center of each for the wooden dowel. 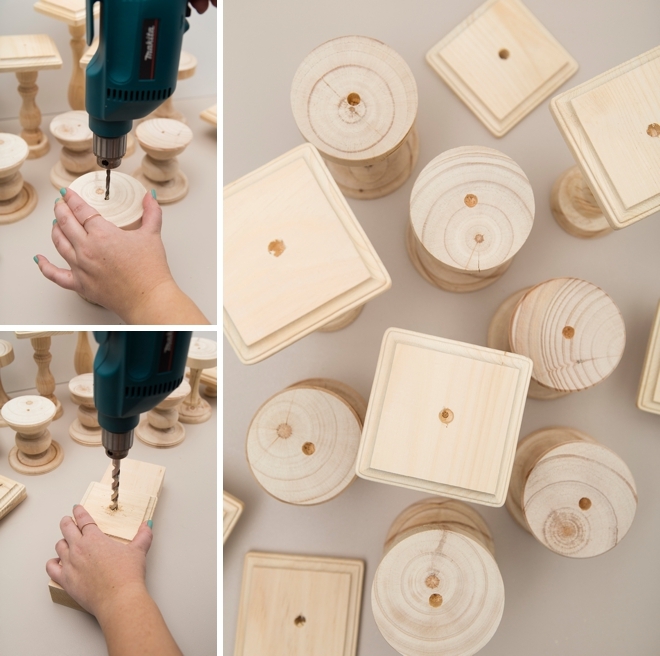 Drill a small, pilot hole first and then use the drill bit to match the size of your dowel, I used 3/8″. 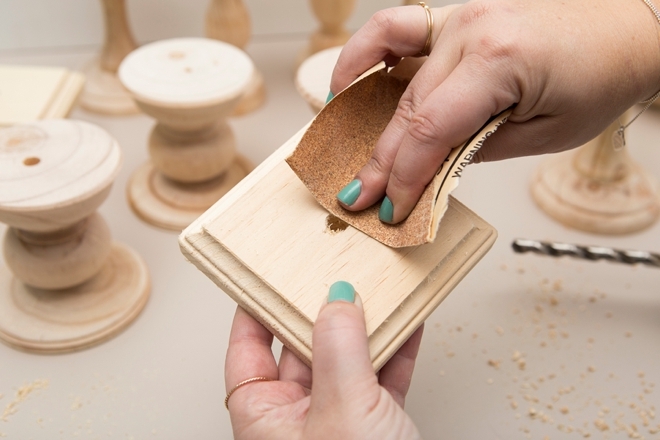 Try to keep the drill as straight as possible so that the dowel goes in straight and not crooked. 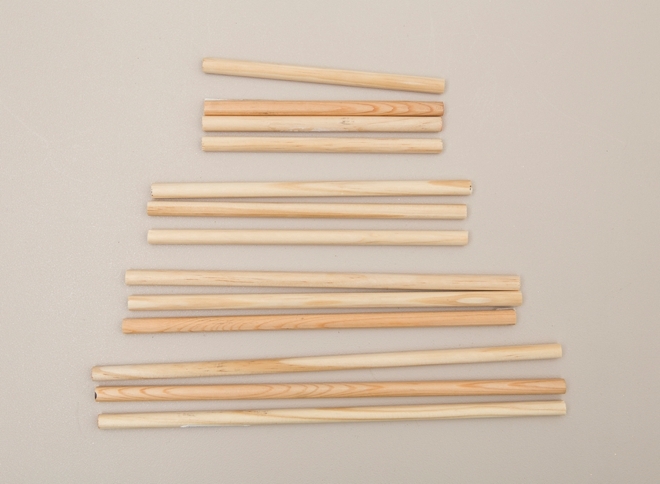 The height of each dowel is totally up to you. 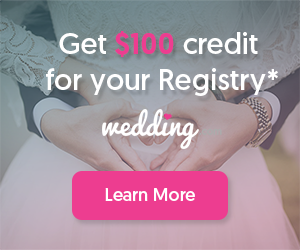 I cut mine down to 12″ 10″, 8″ and 6″…. 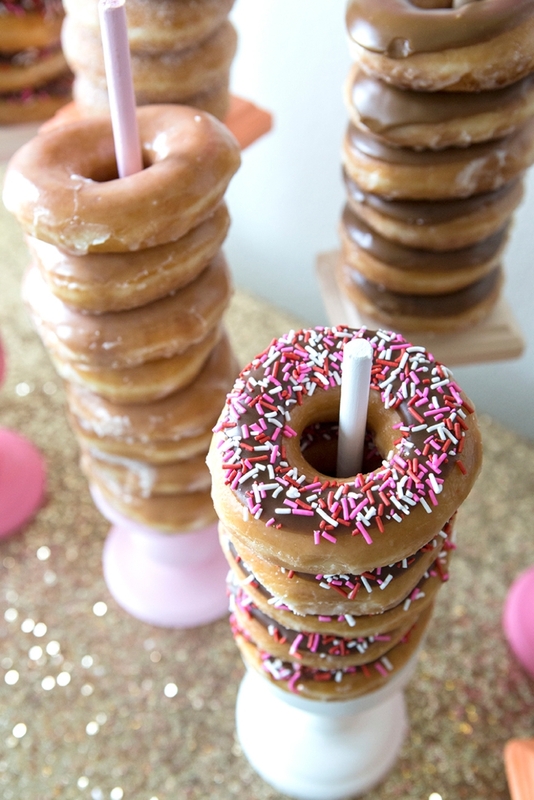 Now create your donut display by gluing a dowel into each base. 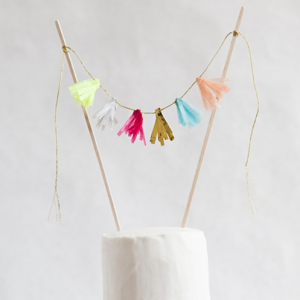 Set up your display to play with the heights before you glue! This step is optional, but adds a lovely touch! 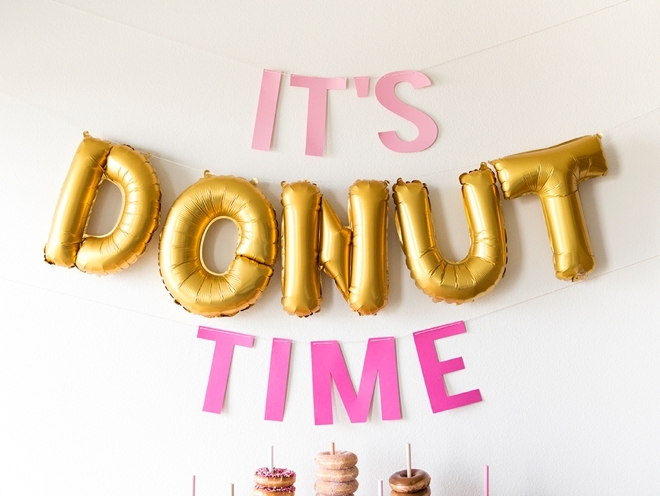 Paint the entire donut stand one solid color. 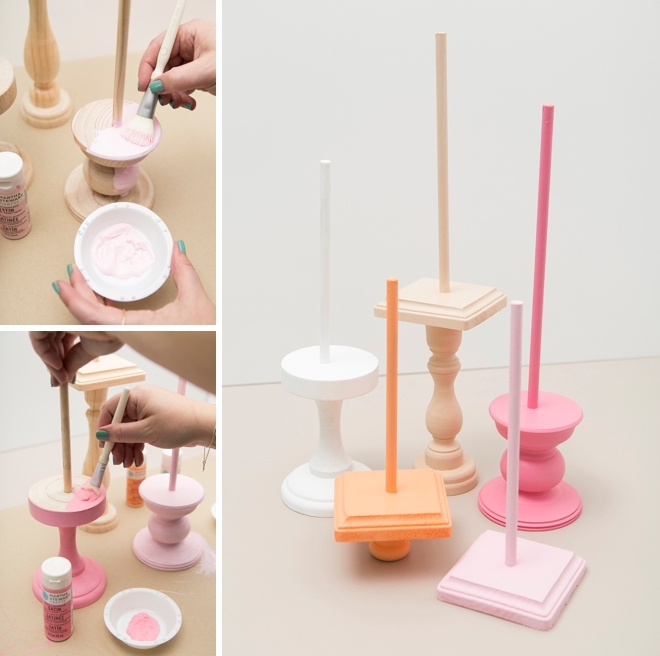 The Martha Stewart Craft Paint is non-toxic, but they don’t recommend the paint touching your food. 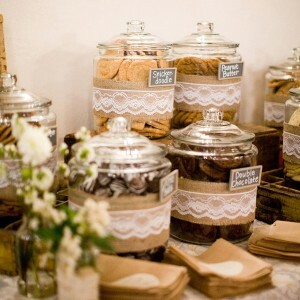 So, if that is going to bother you, cut out little doilies from wax paper to add to the top of each stand. 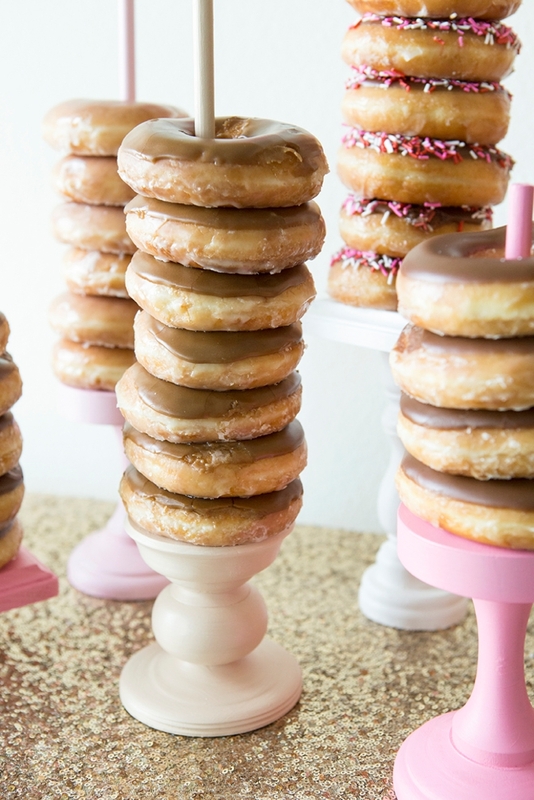 Create a small display or a large display and stack your donuts high! Nominate someone to keep watch and refill the stands if need be. 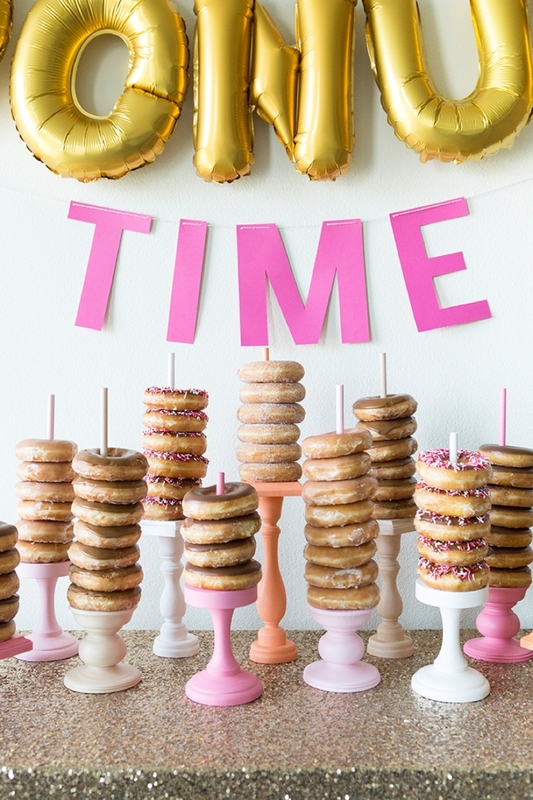 If it were up to me… it would always be Donut Time!